After taking photos and videos of events in your life with your Flip Video camera, you might want to e-mail them to friends and family members. Sharing movies and pictures you capture and create by sending an e-mail message makes it easy to reach out and touch someone with your creations no matter how near or far they are, and it can be done through the FlipShare software that comes preloaded in your Flip camera. 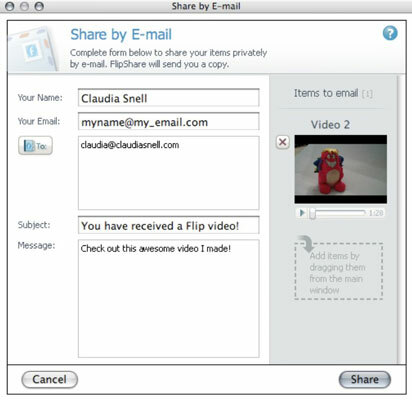 Although FlipShare allows you to send your videos or pictures as an e-mail message, the e-mail message that your recipient receives contains a link inviting them to view your videos or pictures through their Web browser. In other words, the e-mail itself doesn’t contain the actual video or picture files. Launch FlipShare (if it isn’t already running). Click a video or picture item that you want to send as an e-mail. Click the Email icon on the Action bar (or choose Share, Email). The Share by E-mail window appears with a thumbnail of your selected item (or items). (Optional) Add more items from the Share by E-mail window by dragging and dropping items from the Workspace window to the right column of the Share by E-mail window. If you change your mind about a file or add the wrong one, just click the red X in the left corner next to items you want to delete from your e-mail. Fill in each of the text fields. The Share by E-mail window closes, and a progress bar appears in the Progress box as FlipShare sends your e-mail message. An “Items Emailed” message lets you know when FlipShare successfully e-mails your message. When you send a video or picture e-mail, FlipShare also sends a copy of your e-mail to the e-mail address you typed in for yourself. To see what your recipients will see when they open your invitation, open your message in your e-mail program.